Print out the Dutch flag in three sizes, as a jigsaw, bookmarks, or to colour in! You can also enjoy learning a little about the Netherlands in "fun fact" format below. The Kingdom of the Netherlands is a country with two names. Dutch people call their country De Nederland or The Netherlands whilst the name Holland, often used by foreigners, refers to two of the main provinces. The Netherlands is a very flat country. About 25% of the land is below sea level, including Schiphol Airport. This is Europe's most densely populated country, with over 400 people per square km. The total population is 16.75 million. Vaalserberg, a mere 322 metres above sea level, is the country’s highest place. It is in the south where the Dutch, German and Belgian borders meet. Amsterdam is the capital but Den Haag is the seat of government. Amsterdam is named after the River Amstel. 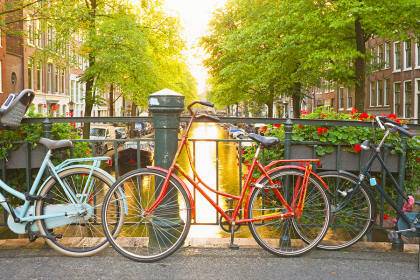 The city has 160 canals and 1,281 bridges. It was built on a swamp so many old buildings are supported by wooden poles. The Anne Frank House is on Prinsengracht canal. Visitors can see where she hid from the Nazis and wrote her diary. Although Anne is the Netherland's most famous daughter, she was born in Germany and came to Amsterdam with her parents aged four. The Rijksmuseum is one of the world’s finest Art Galleries. Rembrandt van Rijn’s famous picture the Night Watch is on display here. The Dutch are the tallest people in the world, with men averaging 184cm or 6 foot 1. It could be due to dairy as everyone seems to drink milk and eat lots Gouda and Edam cheese. The Dutch are the world’s biggest drinkers of coffee after the Scandinavians, consuming over 3 cups a day on average. Famous Dutch painter Vincent Van Gogh produced over 2,000 pictures over his career but only sold one paining during his lifetime. He died a poor man, but his paintings now sell for millions of pounds. Cycling is very popular in Holland. There are twice as many bicycles as cars, and 32,000 km of safe bicycle tracks. The Netherlands is the world’s largest exporter of flowers. Tulips, which were once so rare that they were worth more than gold, are originally from Turkey although most people assume they came from Holland. The tower of St Walfridus in Bedrum is 36 metres high and leans at a greater angle than the famous Leaning Tower of Pisa. Speed Skating on natural ice is popular when the canals freeze. In Friesland there is a marathon race linking 11 towns. New York was originally named New Amsterdam after Dutch settlers established a colony on Manhattan Island in the 1620s.